Spring is nearly here. The silent trees are beginning to bud out. Daffodils are starting to bloom. The grass beneath the snow has turned from blonde to green again. I drove past a field today and saw that someone was already tapping the sap from maple trees. Each season, I cleanse and clear my altar thoroughly. I take everything off of it: statues, cauldron, remnants of long-term spells, candles, focal objects, oils, stones and feathers. I’ll be scraping away remaining wax from completed spells and shaking the ash out into the garden. What is completed is removed and returned to earth. I sweep my altar clean with a small besom for this purpose, and sometimes I sage it. There’s a mirror behind my altar, which I think enhances magical workings. I clean it thoroughly, so that it’s sparkling. Eggs. Eggs are the perfect symbol of Ostara, of new beginnings and new life. I’ll tuck a couple of these into nests that I found at the craft store. I’ve never been able to convince myself to pluck a nest out of the wild, even when I know it’s not being used. I just worry that I’m taking away a potential home from a critter. Nests remind me to focus on home and spring cleaning at this time. Flowers. At this time for me, daffodils and hyacinths are blooming. 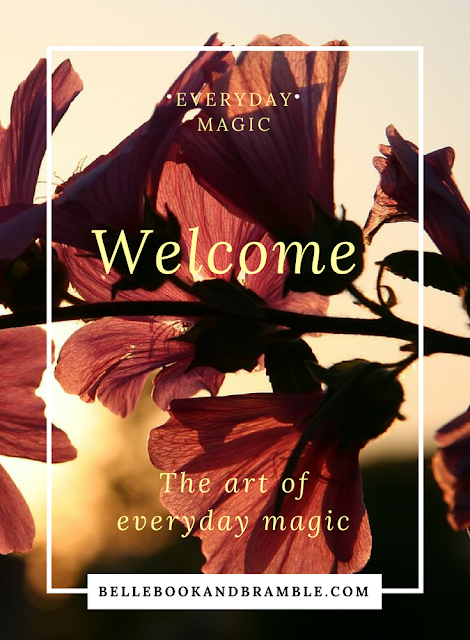 In magic, daffodils are all about new beginnings. And hyacinths bring peace – which I can sorely use at the end of winter. Live plants are also a great choice. I often leave packets of seeds on my alter until I’m ready to plant them. They’re beautiful and I like to think that sitting on my altar gives them a little bit of extra spark! If you want to include pictures of goddesses on your altar, Demeter and Persephone are good choices. Persephone returns from Hades every year for six months to the arms of her mother, and the earth blooms. Floral and herbal scents. Any floral or herbal scent in a candle or oil that appeals to you is perfect for spring. I tend to be interested in spicy scents for fall, such as orange and citrus, and crisp wintery scents for when the days are cold. Spring seems perfect for any flower or even the scent of fresh-cut grass. A spring altar cloth. I like to change out altar cloths with the seasons. My current winter one is a remnant of white lace with a pattern of stags in it. For spring, I’ll swap out a table runner with an abstract floral design in green and violet. An altar cloth can be anything – a fabric remnant, a table runner, a placemat or charger plate, a scarf, a folded curtain valance or tablecloth – anything that gives you joy. A garland. I have some garland left over from my wedding many years ago that I like to drape around my mirror to decorate for spring. If you have a wreath or other botanical-inspired decoration, hanging it on the wall near the altar (but beyond the reach of candle flame) can be a very nice touch that symbolizes the Wheel of the Year. Stones that remind me of spring. Some of my favorites for spring are very soft: rose quartz, angelite, agates, opalite, and amazonite. I put them in a bowl and they remind me of candy. Candles in spring-friendly colors. I have a soft green candle that smells like sage that will be perfect for dressing up my spring altar. There’s another one that I can’t wait to work with that’s a soft yellow, and it’s supposed to smell like sunshine! I also add a few items to symbolize current projects I’m working on through the moon cycle. There’s a small figure of a mermaid there, now, for example, to remind me of a story I want to complete. And there’s a silver dollar to remind me to save money. The important thing to remember in setting an altar is to first clean it, then place objects back with intention. Only keep current items for current workings. And make sure that you have items that represent each of the five elements, such as images of deities or ancestors for spirit, stones for earth, a chalice for water, candles for fire, and scented oils or incense for air. Above all, make certain that you have a space where you can supervise the use of these items safely. 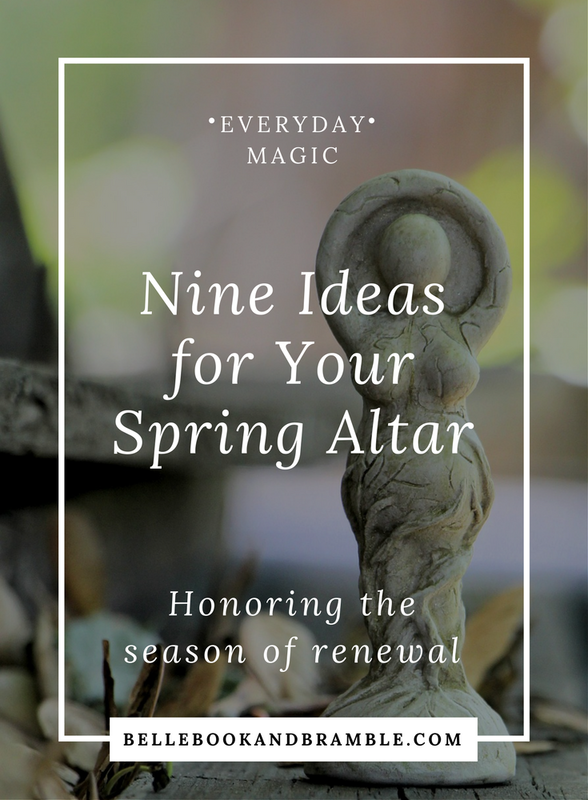 How will you be sprucing up your altar to welcome spring in the coming days? What a lovely description of refreshing an altar including several things I had not thought of and can't wait to try. I like to use a little bird statue or gathered bird feathers for Air. Sending appreciation and Spring blessings! Thank you for the tips. You've reminded me to refresh my current goals and place symbols on my altar. Happy Spring!